Serious Quiz: Menswear Or Womenswear? British designer J. W. Anderson presented his new collection for Versace's diffusion label Versus last night. It was androgynous to say the least, so let's make a game of it. Anderson with Donatella Versace, looking as glam as ever. Anderson's first collection for the label, designed in partnership with Versace's in-house design team, walked at a special show at the Lexington Avenue Armory in New York last night. To describe the clothes as gender-bending would be an understatement. A word of warning pre-quiz: J.W. 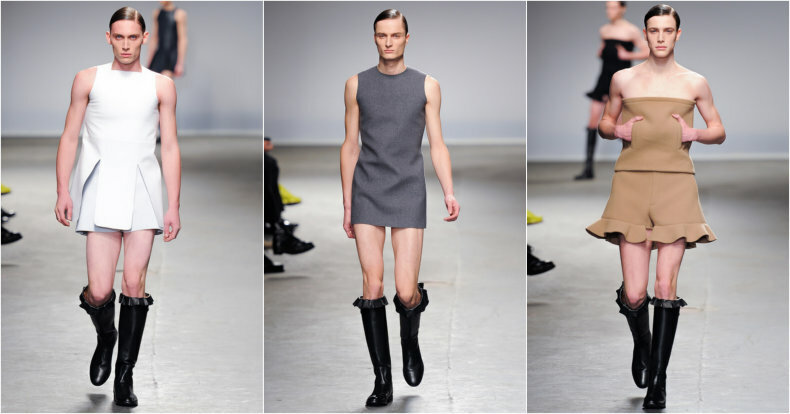 showed male models in frilly skirts on his fall 2013 runway. Guessing whether that's a crop top or maxi skirt for a guy or a girl might be a little more difficult than you first think. Just saying. 1. Here's an easy one to start with. 16. And one celebrity guest in attendance to finish. This was an easy one. I just wanted to include a photo of Darren Criss, to be honest. All images courtesy of Fernanda Calfat/Getty Images. See the collection in full here.